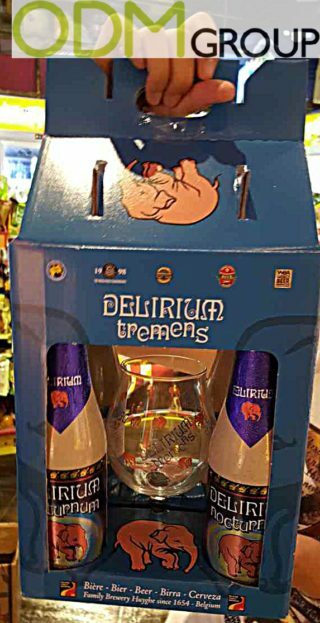 Delirium has recently advertised with a new and unique branded beer promotion. Delirium provides Belgium-beer since 1654 and has advertised with quite a few unique promotional products in the past. Their new unique branded beer promotion comes as an on-pack Gift with Purchase and is directly usable with the product itself. The Blue carton is Pantone matched with the brand and the bottles inside which makes this eye-catching for current and potential costumers. The glass is a perfect on-pack gift, as it can be used right away and also always while drinking a beer by this or any other brand. The shape of the glass fits perfectly to the branding and gives the product the attention, which it deserves. Additional to this is the fact that not many people drink without company, increases the brand awareness and with that your revenue. Why is a Branded Beer Promotion worth to pay attention to? Brand awareness. By using a glass as an On-Pack gift , which will be used a lot of times and may gonna survive centuries in a household, will bring you a long term brand awareness and will increase your costumer loyalty. Practical handle. The unique packaging will make this product an eye catcher in a lot of shops and stores. It does not only matches perfectly with the brand and the bottles but is also very practical with its handle above, so you never need to worry about, if your bag will rip open. At ODM we have significant experience in product design, sourcing and manufacturing. We can help you with your marketing budgets effectively. Be sure to contact us if you are interested in finding out more information about branded beer promotion. Custom Glassware Promos – Belgian Beer Leading the way.